We feel extremely happy to bring you "Charaka Samhita" the text with English translation. The book is unique of its kind as if is conceived as per the needs of B.A.M.S. Graduates, beginners of Ayurveda as well as allied subject seekers. We have attempted to bring before you the best treatise of Ayurveda of Agnivesha in very simple and easy English along with relevant explanations from commentaries wherever necessary. We are thankful to our dearest students community for over whelming response for our earlier "Text book of Swasthavritta" and hope to receive the similar encouragement for this endeavor also. Dr. Shashirekha H. K., Born in Hassan, Kamataka. She was completed Graduation (2006) and Post Graduation in Ayrveda Samhita (2010) from Rajiv Gandhi University of Health Science, Bangalore, Kamataka and Ph.D. in Ayurveda (Samhita) from Tilak Maharashtra Vidyapeeta, Pune Maharashtra. M.A. (Sanskrit) from Kamataka State Open University Mysore, Kamataka, M. Sc. (Psychology) from Madurai Kamaraj University, Madurai, Tamil Nadu and M. Sc. (Yoga) from Periyar University (PRIDE), salem, Tamil Nadu. She published more than 15 papers in various Peer Reviewed International Journal. Currently she is working as Associate Professor in the Department of Samhita- Siddhanta at Sri. Dharmasthala Manjunatheshwara College of Ayurveda and Hospital Hassan, Kamataka. She is acclaimed teacher for graduate and post graduate scholars. Dr. Bargale Sushaot Sukumar, Born in Sangli, Maharsahtra. He has completed Graduation (2006) and Post Graduation in Swasthavritta (2010) and Pursuing Ph. D. in Ayurveda (Swasthavritta) from Rajiv Gandhi University of Health Science, Bangalore, Karnataka. He has completed M. Se, (Yoga) from Periyar University (PRIDE), Salem, Tamil Nadu and M. Sc. (psychology) from Madurai Kamaraj University, Madurai, Tamil Nadu. Currently he is working as Assistant Professor in the Department of Swasthavtitta and Yoga at Sri. Dharmasthala Manjunatheshwara College of Ayurveda and Hospital Hassan, Karnataka. He has published many articles in National and International Peer reviewed journals and presented more than 8 papers in various International and National conferences. 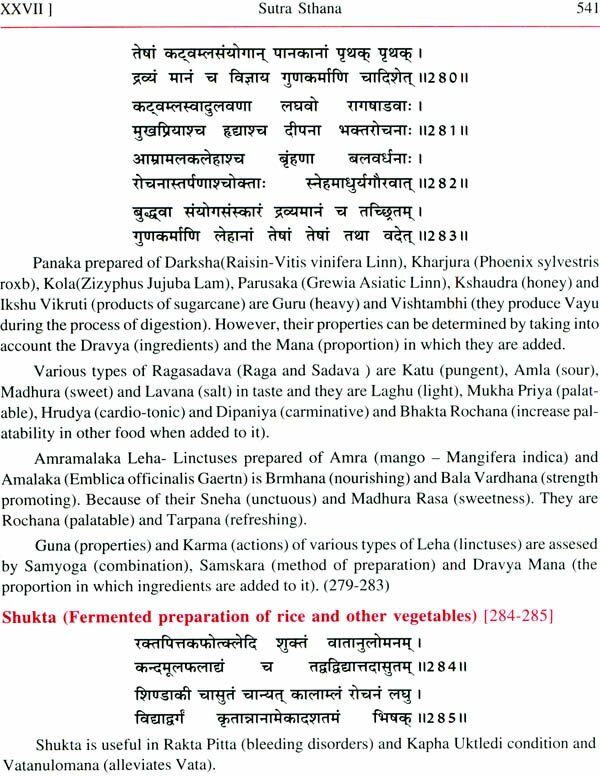 Text of Charaka Samhita is the part of undergraduates learning of Ayurveda. A comprehensive learning of this text is must for clinical success of a Vaidya. So it becomes of Charaka Samhita inevitable to have a text book for easy understanding. In this regard present work is very useful. 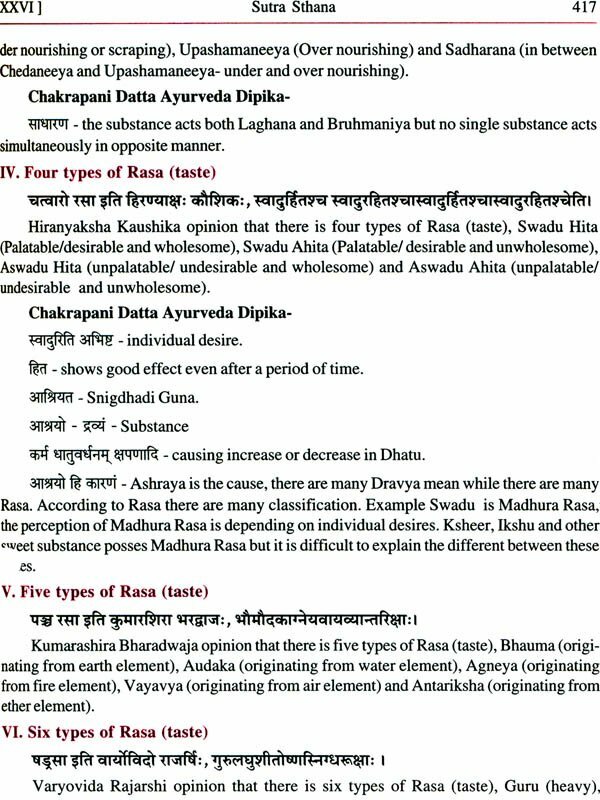 It is written in simple English with essential part of Ayurveda Dipika commentary of Chakrapani wherever needed. I here with appreciate the work of Dr. Shashirekha H. K., and Dr. Bargale Sushant Sukumar and their contribution for making text of Charaka Samhita student friendly. I wish all success to them. The Ayurvedic literature mainly the Charaka Samhita is knowledge encyclopedia considered as the best amongst the Bruhatrayee. 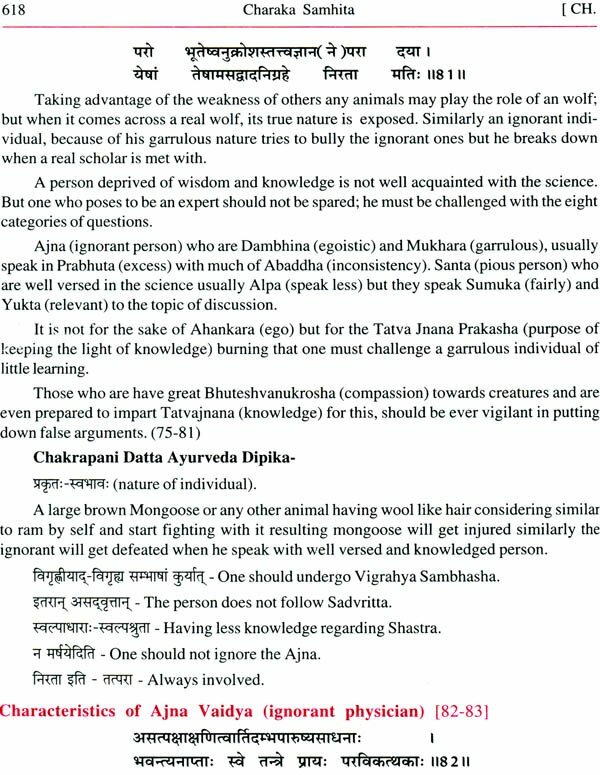 The other two are the Sushruta Samhita and Vagbhata Samhita. The formation of Charaka Samhita signifies the concept of literary research in Ayurveda. 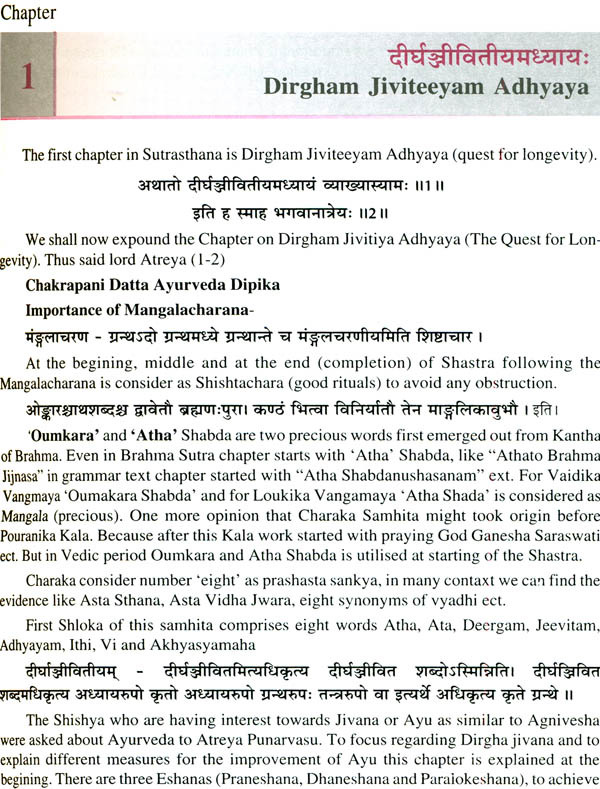 The Charaka Samhita states that the content of the book was first taught by Atreya and then subsequently codified by Agnivesha, revised by Charaka and the manuscripts that survive into the modem era are based on the Manuscript edited by Dridhabala. Dridhabala stated in the Charaka Samhita that he wrote one third of the book all by himself because this portion of the book had been lost, and that he re-wrote the last part of the book. Acharya Atreya Punarvasu (the narrator)- Atrya Punarvasu also famous by the name Chadrabhagi or Chadrabhaga, because his mother name was Chadrabhaga, he was the son and disciple of Maharshi Atri. 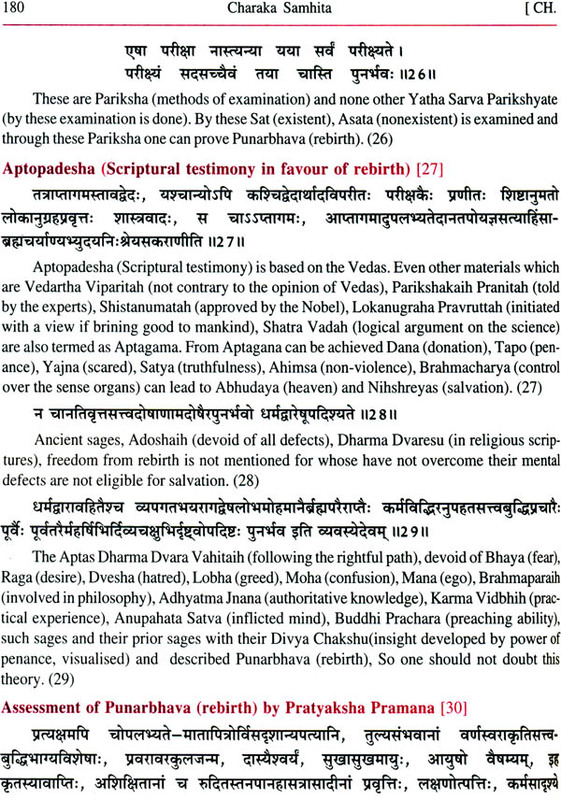 The available Charaka Samhita was narrated to the Acharya Agnivesha by Acharya Atreya. Thus the Acharya Atreya laid down the foundation of the greatest text of Ayurveda known as Charaka Samhita. His period is believed to be around 1000 B.C. i.e. 3000 years back. Acharya Agnivesha (primary author)- The disciple of the teacher Atreya and having a sharp intellect form accredited for the creation of the first text of the Ayurveda in a very concise form as the Tantra. Thus the narrator Atreya and the disciple Agnivesha share the same page in the history. The deliberations on the four limbs of treatment i.e. Chikitsa Chatushapada in the lines of the Upanishasa and the concept of wishes or desires is an indication of his might in the Ayurveda knowledge. Acharya Charaka (2nd century B.C. 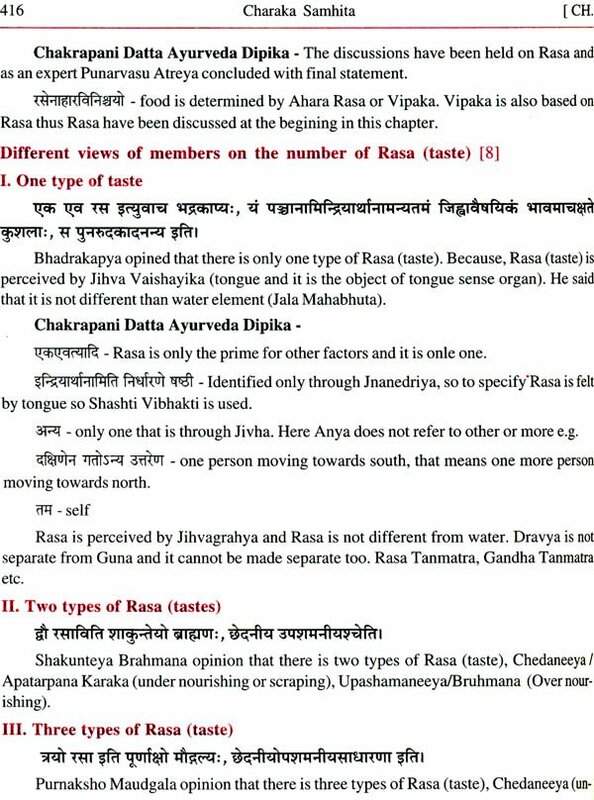 - secondary author or the redactor)- Original name of Charaka is Kapishthala Charaka, son of Vishuddha, student of Vaishampayana and Charaka was the Raja Vaidya of Rajya Kanishka. The place of Charaka was Kapisthala Grama which is near to bank of river Chadrabhaga (Iravati). Charaka is one of the most well known names associated with Ayurveda. One of the stalwarts of Ayurveda who has re- dacted the Agnivesha Tantra and made in to the Samhita form known as Charaka Samhita. Charaka is considered to be an incarnation of the lord of the serpents, Adi Shesha. Also he is considered to be the community which was the branch of Krishna Yajurveda. He is also believed of the six categories epistemology of the school of Nyaya and the inclusion of the disciplinary known as Swasthavritta in Ayurveda parlance. Acharya Dridhbala (4th century B.C.) - Dridhabala is son of Kapilabali. 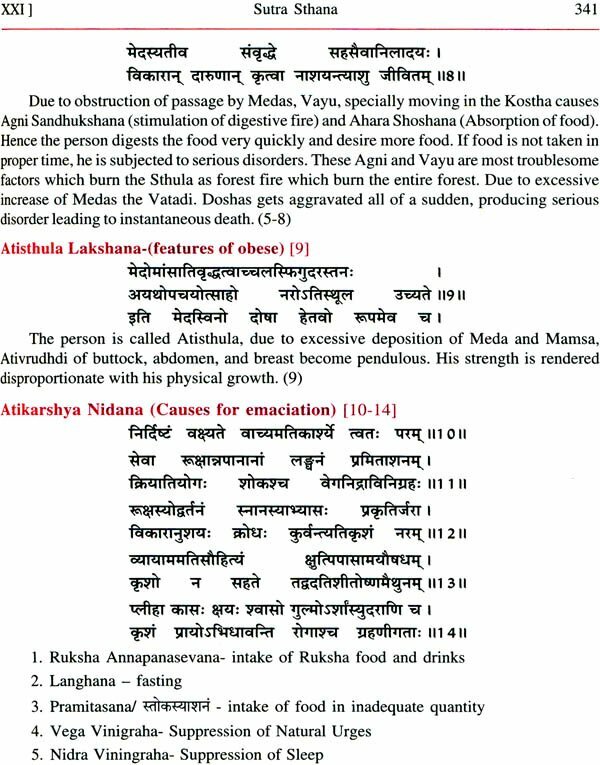 The final strata of the completion of the Charaka Samhita is the addition of the chapter missing from the erstwhile or previous text redacted by the Acharya Charaka. Thus, the missing 41 chapters (17 of the Chikitsa Sthana, 12 of the Kalpa Sthana and 12 of the Siddhi Sthana). The methodology used by the Dridhbala is the selective and collective methodology called the Unchha and Shila Vritti respectively. 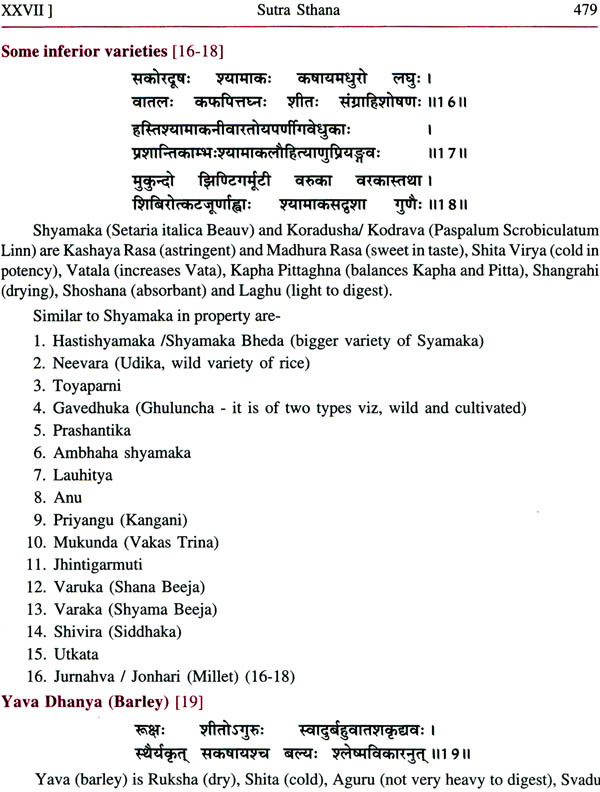 Classification of Charaka Samhita - The Charaka Samhita is divided into eight Sthana or section namely the Sutra, Nidana, Vimana, Sharira, Chikitsa, Kalpa and Siddhi Sthana respectively. As per Shivadasa Sena there was presence ofUttara Tantra in Cahraka Samhita. Further information regarding Uttara Tantra is not available. 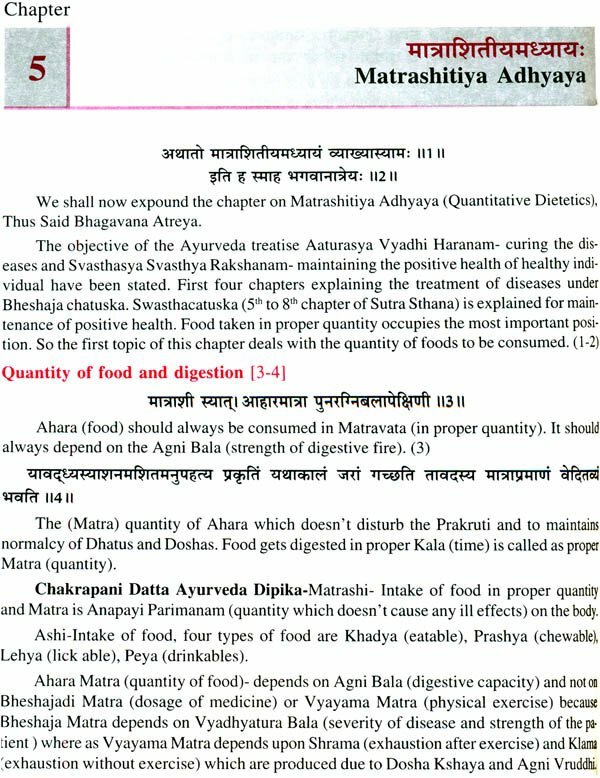 The sequence of these sections is of great significance as it is with aims and objectives of the Ayurveda (indigenous system of medicine). The first and foremost target is the maintenance of health by following the Ayurveda system of life. The methodology of Ayurveda living and the basic doctrine of Ayurveda which is its foundation are vividly explained in the first section or the Sutra Sthana known as the brain of the Charaka Samhita. The essence of the knowledge of the whole text is extracted in its Sutra Sthana. The whole treatise is directed by the Sutra Sthana. 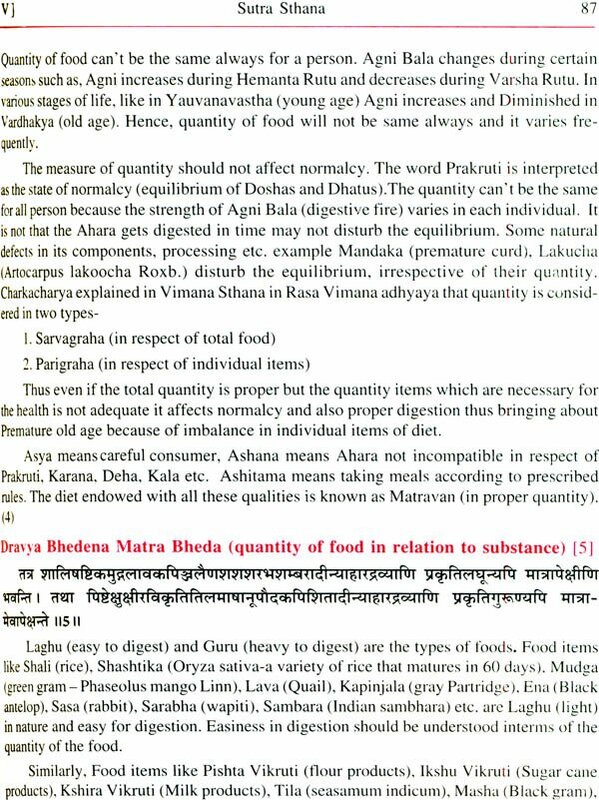 The predominance of the Sutra Sthana can be ganged by its analogy to the nectar. The Sutra Sthana is the nectar of knowledge and is the collection of all the basics of Ayurveda medicine. 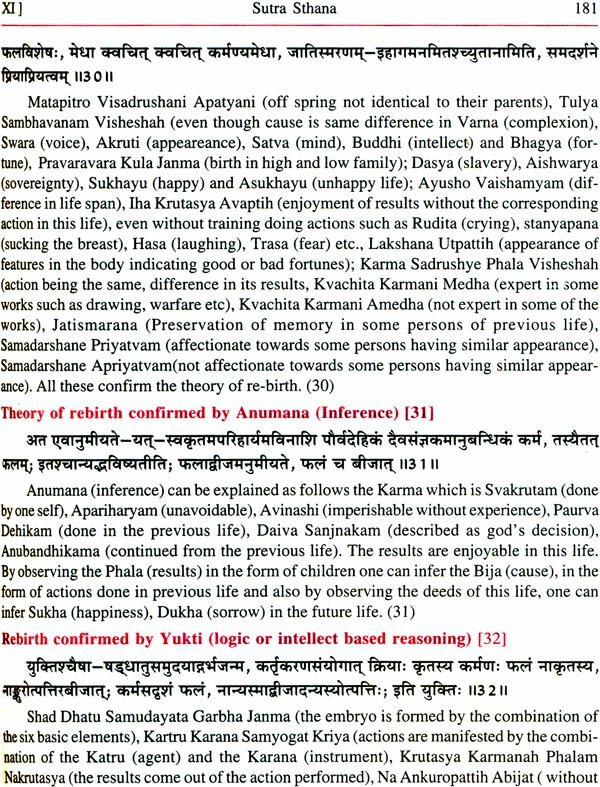 All the three major treaties namely the Charaka Samhita, Sushruta Samhita and the Astanga Hrudyam accord the highest importance to this first section called as the Sutra Sthana. 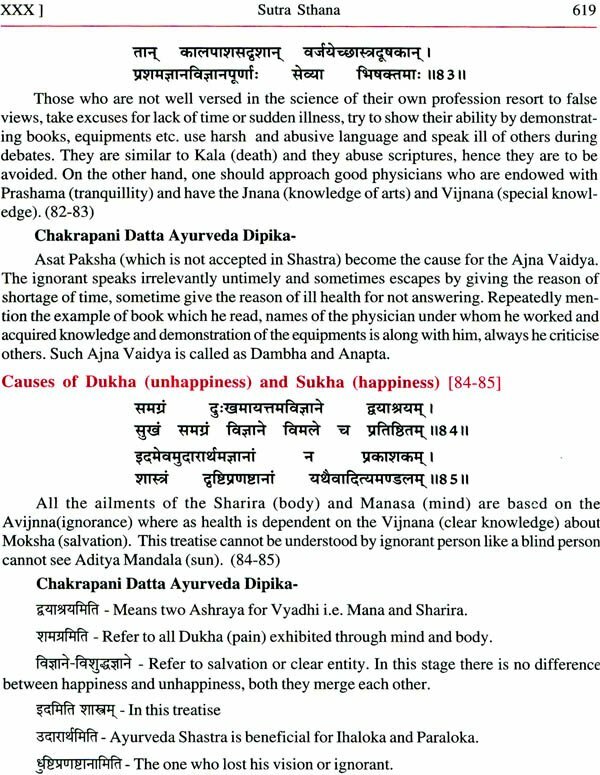 Total 1950 Aushadhi Yoga mentioned in that 1600 Yoga explained in Chikitsa Sthana. 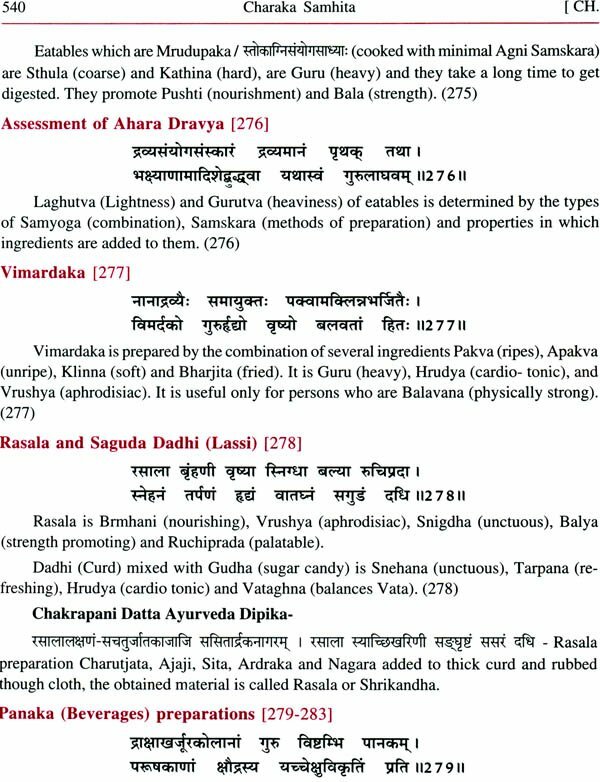 The original Charaka Samhita is of one volume, but the currently available Charaka Samhita (commentary of various authors) is in two parts like Purvardha and Uttarardha. 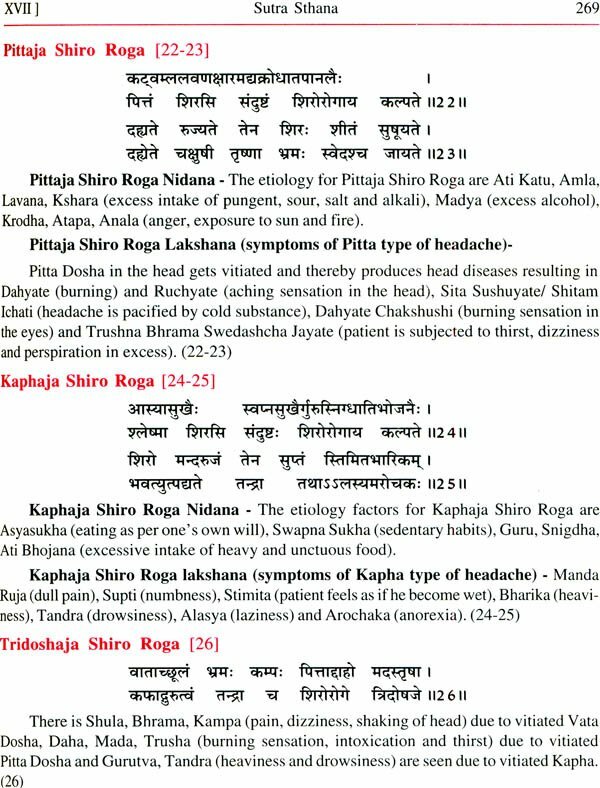 Purvardha contains 5 sections Sutra Sthana, Nidana sthana, Vimana Sthana, Sharira Sthana, Indriya Sthana and Uttarardha contains 3 sections Chikitsa, Kalpa Sthana and Siddhi Sthana. These available in two parts are Hindhi commentary of Charaka Samhita, as different commentaries in different languages like English, Guajarati, Arabic, Persian etc. are also available which are written by different Acharayas and learned Vaidyas. In Charaka Samhita there are total 68 Acharyas names and 14 Desha (places) were mentioned. Charaka Samhita is explained on the base of four Sutra they are Guru Sutra, Shishya Sutra, Pratisamskarta Sutra and Ekiya Sutra. 3. Bhuyovirodha Swalpam Nyaya- Cha. Suo 14/16-19, Cha. Su/ 26/27, Cha. Su. 30. 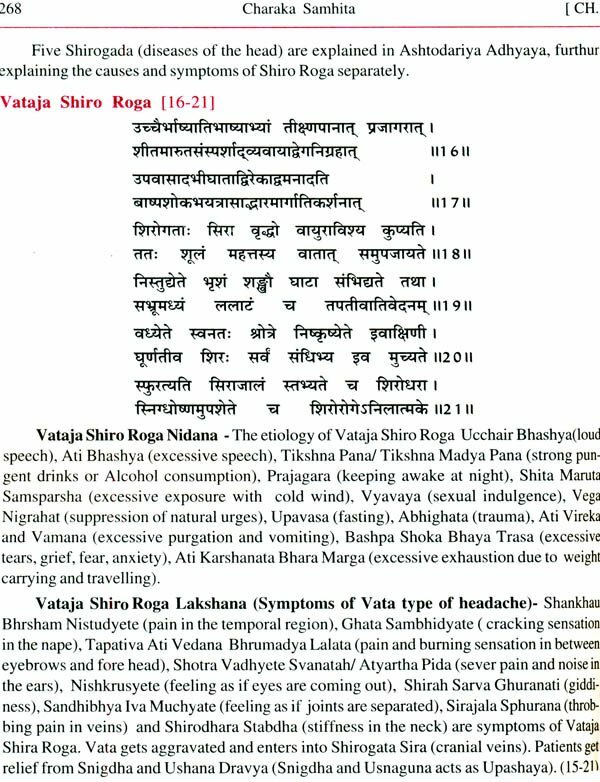 The Sutra Sthana is that section where a collection of various important Sutras or Shlokas related to various context are described, for which it is, also known as Shloka Sthana. 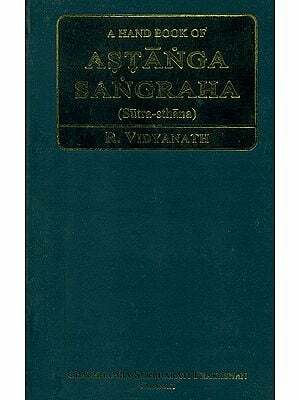 This Sthana contains 1952 Sutras and which divided into quartets which is a group of four chapters, thus the total of thirty chapter are categorized under the seven groups of four chapters known as Sapta Chatushka and the remaining two chapter are the collection of the information termed as the Sangraha Dwaya. 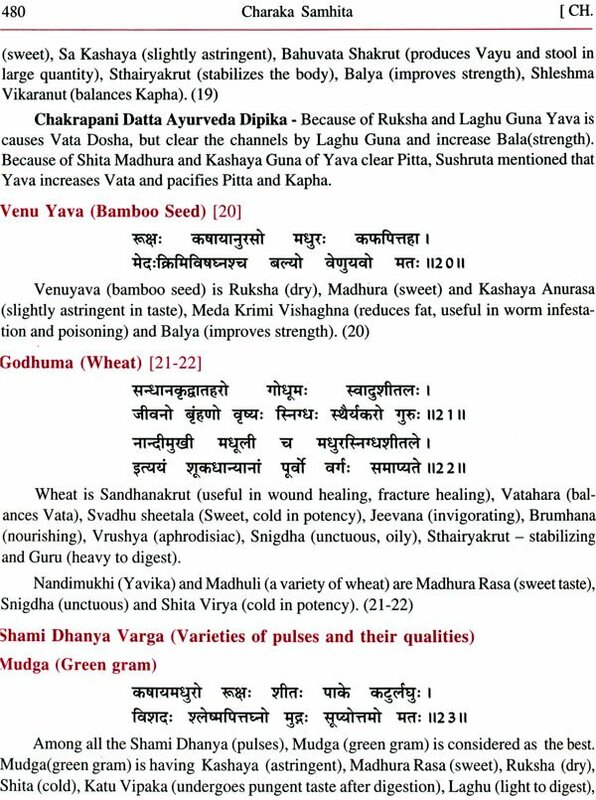 These quartets convey all the basic information of the Ayurveda system of medicine but the information is in ended form which needs to be deciphered in all its merit.